Kinetta Beach Resort & Spa is a small paradise situated at an ideal location in Kinetta Attikis, at 7th km from the quaint seaside village of Agioi Theodoroi and 6th km from Athens. The beauty and harmony of the surrounding nature make the hotel a paradise mixture of natural beauty and luxury, ideal for relaxation and recreation. The hotel has 250 spacious guestrooms opening to splendid sea or garden views. All rooms are appointed with modern amenities for a comfortable stay, including air conditioning, full bath or shower, phone, safe box, TV, balcony or terrace. Two restaurants, which offer a panoramic view of the blue seawaters, serve rich buffets for guests to get acquainted with local delicacies accompanied by fine local wines. There are two swimming pools. 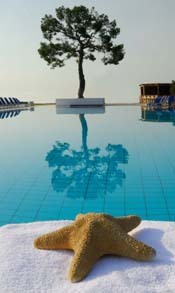 One Olympic size with seawater swimming pool, comfortable public areas decorated with style, two bars. K Spa is a relaxing place, where you can enjoy a variety of massages and therapies or simply revive in the warm swimming pool and jacuzi with the healing power of sea water. Follow the warm path of the sauna and turkish bath. The spa offers a compact gym and state of art technologies which are sure to give you a memorable experience. Various events and activities, such as dance nights, athletic contests, trekking and water sports are organized daily. The hotel staff also organizes daily excursions to nearby areas, as well as to Athens and sites in the Peloponnese. For guests who wish to combine business with pleasure, the hotel offers suitable facilities for conferences meetings or any other events.